If you’ve been following my twitter page, you probably saw the drama go down where I had a shattered rear window on my ancient car. There was no rhyme or reason or any object found, apparently 17 years was enough for the window and it decided to crack, shatter and then cave in. So much drama and it involved me driving out to my husband’s work, taping it up so he we could make the commute home in rush hour and then me sitting around while a new one was installed today. I hate to be all “cool story bro” so the reason I’m sharing all this with you is because today’s makeover has been delayed due to drama. So in the meantime I’m bumping up a post from the future. It’ll be like time traveling. I know a lot of people have been posting their New Year’s decorating resolutions around the web and a common theme has been to finish a room by adding a rug. 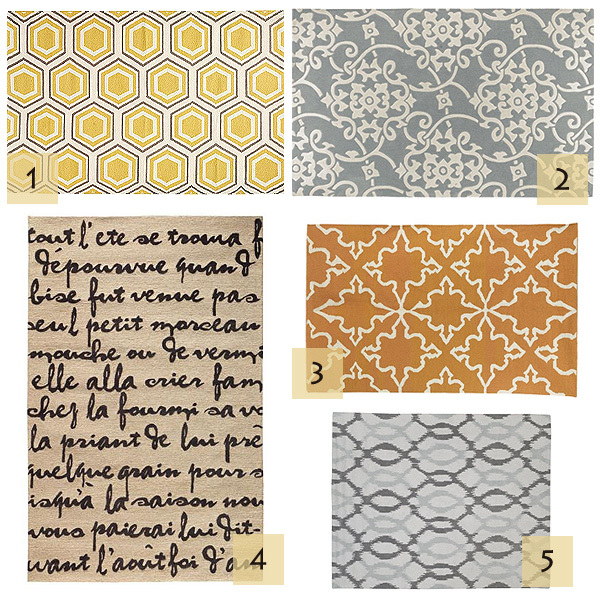 Here’s my top 5 favorite patterned rugs I’ve come across in 2012. Castleberry Area Rug in gold/gray, Home Decorators Collection. 8×11, $449. Other sizes and colors available. Merit II Area Rug in gray/silver, Home Decorators Collection. 8×11, $749. Other sizes and colors available. Iznik Dhurrie Rug in sorrel, West Elm. 8×10, $479. Other sizes and colors available. Sonnet Area Rug in black, Home Decorators Collection. 7’6″x9’6″, $529. Other sizes and colors available. Ikat Links Rug, West Elm. 8×10, $649. Other sizes available. I’ll be back soon with some of my favorite floral rugs. Hopefully tomorrow my lazy susan will make her (lazy) appearance. Numbers 4 and 5 are on my list of possibles for my dining room. I think I need to add number 1 too. I know Home Decorators runs a lot of sales and discounts so if you don’t already get their catalog you can subscribe and I get a coupon with every edition. I bought my own dining room rug through them (the tangier) and saved $15 with the code they had. Oh my! Sorry about your car window!